The stories told by our ancestors usually related natural phenomena back to ourselves, which makes sense since it’s what we already know. We extrapolate our own self awareness to other parts of our world. Let’s take a look at a logical thought process of an early ancestor to clarify. 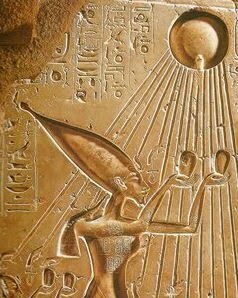 Many ancient civilizations were centered around worshipping the sun and stories were created using the sun god as one of the characters. Although different cultures all have vastly different religious stories, many of them begin with darkness and introduce the god as a light bringer. This is important because it shows that we started from the same basic thought process and diversified based on our surroundings. Religious leaders created basic laws for humanity to do no harm to those around you. A law that you’re told was the direct word of god will carry much more weight than the laws made by other humans. With the power to personally communicate with the god, religious leaders could elevate in power to join with, or become, the government leaders. Sometimes this took the form of god-kings, to further increase the authority of the human king. Other times it meant that the voice of god could command armies and wipe out non-believers. Just like almost all cultures began with darkness and a light bringing god before diversifying, Christianity too diversified into many sects that in turn diversified more. The reasons for diversification ranged from disagreement with the official law to simply adaptation to more modern times. Despite all diversification, the majority of religions tend to teach nearly identical lessons in different ways. We have finally discovered our true origin story and it’s way cooler than any story that humans have made up along the way. Lessons can easily be added to it much like our ancestors did with their own made-up stories. It’s time we all see the world as it truly is, not as the stories that people have created to explain it.